3DTopological insulators are a relatively new class of material, characterised by a bulk energy gap and metallic surface states. These surface states, which result from a band inversion due to large spin-orbit interaction in these materials, are spin-momentum locked and topologically protected from backscattering, opening up the potential for creating dissipationless spin-polarized currents with applications in the fields of spintronics and quantum computation. Of the 3D TI materials Bi2Se3 is one of the most attractive due to its large band-gap (approx 0.3 eV) which opens up the possibility of creating TI spintronic devices operating at room temperature. However, the presence of intrinsic bulk defects such as Se vacancies, results in a significant bulk carrier density, and the presence of interface defects can lead to surface band-bending and a 2D accumulation layer at the surface. These parallel conducting layers prevent a clear signature of the surface states being visible in electrical measurements. One of the challenges for MBE growth is to reduce the bulk and interface defects in this material, both by choice of growth conditions and heterostructure design. Another challenge is to create a magnetically doped TI – the difficulty here being that many magnetic impurities do not sit in substitutional sites, and/or they segregate forming clusters of a different material inside the TI thin film. Using a Riber compact 21 system we have achieved a 2DEG mobility of 2.106 cm2V-1s-1 with a 2DEG carrier density of 3.1011 cm-2 where the 2DEG is located at a normal GaAs/Al0.33Ga0.67As interface 90 nm below the surface, and bulk modulation doping was used (see figure). This indicates that the background impurity concentration in the chamber is relatively low – in the mid 10-14 cm-3 range. Further improvements in mobility could be achieved both by modifying the heterostructure design and by adding additional pumps to our MBE system (currently equipped with only one pump – a 400L/s ion pump). In addition, following the recent award of an equipment grant by the Ile de France region, we will be buying a new MBE machine to carry out the growth of transition metal dichalcogenides in the near future. Photon energy dependence of circular dichroism in angle-resolved photoemission spectroscopy of Bi2Se3 Dirac states, F. Vidal, M. Eddrief, B. Rache Salles, I. Vobornik, E. Velez-Fort, G. Panaccione, and M. Marangolo Phys. Rev. B 88, 241410(R) (2013). 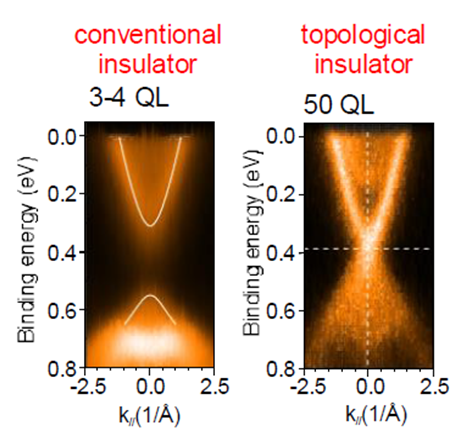 Low-temperature Raman fingerprints for few-quintuple layer topological insulator Bi2Se3 films epitaxied on GaAs, M. Eddrief, P. Atkinson, V. Etgens, B. Jusserand, Nanotechnology 25, 245701 (2014).